Shop Personal Protection with Brownells! Too many shooters who practice concealed carry overlook spare ammo — a critical aspect of effective personal protection. Here Massad Ayoob refutes 6 of the most common objections to carrying more rounds. An amazing number of people who carry loaded guns carry them without a reload. I’m not going to dump on them here—in my (much) younger days, I used to be among their number. Hell, I had a gun didn’t I? And I was a good shot, right? How much ammo was I likely to need, anyway? The years taught me the fallacy of those arguments, as well as others that I hear from folks in gun discussions, particularly those on the Internet. Let’s look at some of the excuses not to carry extra ammunition. #1: Odds are I’m not gonna have to fire this thing at all, let alone run it dry and still be in a gunfight. True enough. Trouble is, we don’t carry guns because of the odds of needing one, or most of us wouldn’t carry at all. We carry because if, against the odds, we do need one and don’t have it, the cost of being unable to save our own life and the lives of those who count on us to protect them is so catastrophic as to be simply unacceptable. If you are in the uncommon situation where you run the gun dry and the danger is still present, you’re back to not having a loaded gun when you desperately need one. #2. If I need more than the five shots in my snub-nose 38, I couldn’t have won the fight with more. No. If you haven’t won the fight with five shots, all it means is, you need more than five shots to win the fight. In the 1970s, the Illinois State Police gave me free rein to poll their troopers and study their gunfights, back when they were the only troopers in the country carrying auto-loading pistols. I was able to identify 13 troopers who almost certainly survived because they had auto-loaders (single-stack 9mm S&W Model 39s) instead of the six-shot revolvers they carried before. #3. But I’m not a cop! Doesn’t matter. You’re facing the same scumbags they face. I’ve run across the occasional case where the private citizen has run dry, reloaded and prevailed. I’ve also run into cases where they emptied their gun and the danger was still there. A good friend of mine, Richard Davis, shot it out with three armed robbery suspects in a Detroit alley many years ago. When the last round in his six-shot revolver went off, he had severely wounded one opponent, seriously wounded a second, and slightly wounded a third. With no spare ammo he had nothing to do but run, at which time one of the perps shot him twice. He survived—and learned to carry powerful semi-auto pistols with spare ammunition. #4. But those guys had guns all over the place. I’m out and about—I can’t do what they did. No. And if they’d had just had one gun with no spare ammunition they couldn’t have, either. Which is why I’ve come to recommend that if you carry a gun, it’s an awfully good idea to carry spare ammunition for it. Why do you suppose every uniformed street cop you see has that ammo pouch on the duty belt? Remember, you’re preparing yourself to face, alone, the exact same violent criminals for which society has armed those police officers in anticipation of facing. #5. I carry an 18-shot auto pistol, so I don’t have to worry about running out of ammunition. While that’s debatable, you do have to worry about your auto pistol malfunctioning. It happens to the best of them, and any gunsmith or armorer will tell you that assuming you’re using good quality ammunition, the single most common cause of an autoloader’s stoppage is something going wrong with the magazine. 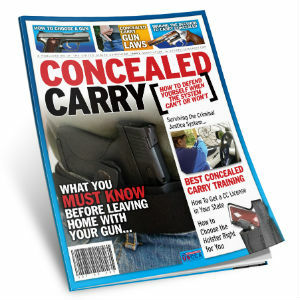 Clearing the stoppage and getting back to fighting may require replacing the defective or compromised magazine with a fresh one. Another predictable occurrence is the struggle for the gun. As noted in my study of Illinois troopers, one department alone had several “saves” when the troopers deliberately “killed the guns” by pressing the mag releases during the struggle. Suppose you’ve done that successfully and retained control of the gun—and the bad guy now pulls a knife. With your magazine lost on the ground in the dark, you have, at best, a single-shot pistol with which to defend yourself, and not even that if your gun has the disconnector safety feature. #6. Well, if my five shots or six shots aren’t enough, I’ll just run away. An amusing suggestion, but if you could have run away, why didn’t you do so before? The very fact that you’re in a situation that has required you to empty a gun at one or more human beings probably indicates that if you turn and run, you’ll just get a few bullets in the back.